SKY MAP: Mars is easy to spot in late evening through until dawn. Here it is shown at 9 p.m. from mid-northern latitudes on Oct. 29. This weekend Mars will make its closest approach to Earth until June 2018. While the event won't make Mars seem any bigger or brighter than the night before or after, it is among the best chances in a lifetime to view the planet. 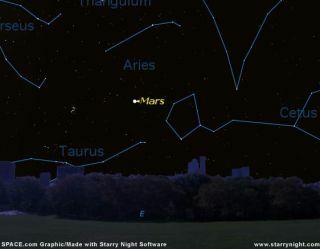 After brilliant Venus sets, Mars is the brightest "star" in the evening sky [map]. It comes up around a quarter-hour after sunset, but give it at least two more hours to climb above the poor seeing near the horizon. By then it will be at an altitude of around 20 degrees as seen from mid-northern latitudes. Your clinched fist held at arm's length is roughly equal to 10 degrees, so two hours after it rises, Mars will be about "two-fists" up from the east-northeast horizon. Mars appears much sharper and steadier when it crosses the southern meridian, soon after local midnight. Its altitude is then about 66 degrees (more than "six fists" up from the southern horizon). Mars comes closest to the Earth Saturday night (around 11:25 p.m. Eastern daylight time). The planet is then 43,137,071 miles (69,422,386 kilometers) from Earth, measured center to center. It is at opposition nine days later, on Nov. 7. Anyone who has a telescope, no matter how modest it may be, will surely want to see what it can do with Mars. Telescopic observers everywhere will be spying out Mars' bright polar areas, dark surface markings, white clouds and yellow dust storms. On the night of Mars' closest approach, a telescope magnifying 90 power will make the planet seem to be the same angular size, as the full Moon would appear with the unaided eye. Seeing the largest dark markings should be fairly easy, but finer details are notoriously difficult. During November Mars departs Earth's vicinity as rapidly as it arrived. Between Nov. 7 and Nov. 30, it loses nearly half its brightness, diminishing from magnitude -2.3 to -1.6. But at the same time, Mars will be very well placed for convenient viewing. Unlike earlier in the fall, you won't have to get up in the early morning hours to see it high in the sky. Mars will be due south at around midnight near the time of its opposition, and around 9:45 p.m. local standard time at the end of November. On Nov. 14, Mars will be situated below and to the left of the Moon, just one night before it turns full.